Whaddya in for ... Oz the Great and Powerful or the Oscars? 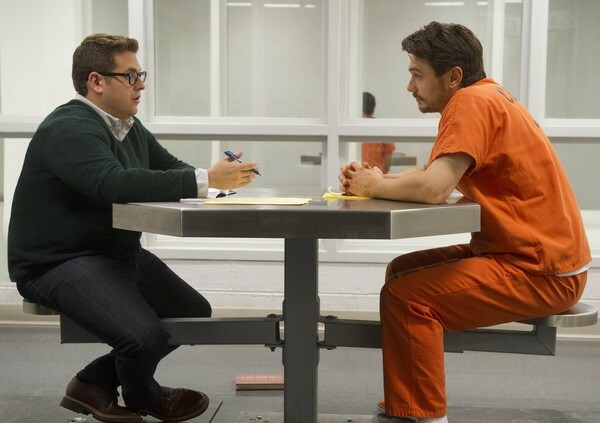 True Story leaves you more perplexed about the jailhouse tête–à–têtes between defrocked New York Times reporter Mike Finkel (Jonah Hill) and accused murderer Christian Longo (James Franco) than before the opening credits. That’s probably by design. After being fired from the NYT for fabricating composite characters for an article about the African slave trade, the disgraced Finkel learns that Longo used Finkel as an alias while a fugitive from supposedly killing his wife and three children. After Longo’s capture, Finkel travels to Oregon and conducts numerous pretrial interviews with Longo, aiming to eventually unveil Longo’s “true story” in novel form. The onscreen conversations between Finkel and Longo are meandering and tepid, the sort of yammering that pads a movie’s running time but contributes little else. Finkel becomes convinced of Longo’s innocence, but during their chats Longo declines to detail the circumstances surrounding the deaths of his family. Indeed, Longo altogether evades addressing that pivotal topic. Thus any sense of betrayal Finkel ultimately conveys at being duped by an alleged criminal—surely not!—is unearned and, frankly, feels like revisionist history. The duplicity at play is encapsulated in a couple of companion scenes. First, a federal agent (Robert John Burke) harangues Finkel for not sharing the contents of his correspondences with Longo with law enforcement, claiming (quite erroneously) that Finkel’s refusal could result in Longo going free. Later, once Finkel begins to comprehend another horrible truth, he frantically offers his work product to the agent, who now declines the information because Finkel’s lack of credibility would taint the evidence. It’s a scene utterly egregious on multiple levels if true, and illogical and self-serving if fabricated. Finkel frames himself as willing to jettison his journalistic ethics (again) for the sake of rehabilitating his moral image in the eyes of his readers/audience. Indeed, the true purpose of Finkel’s investigation seems like his desire for an In Cold Blood-style redemptive book deal, with this film adaptation rightly seen as another means for Finkel to wring cash out of this scoop. That’s fine if Finkel implicates his own ambition as part of this complicated story, showing how it may have clouded his journalistic discernment with the aid of a deceptive foil. But Finkel wants to cast himself as a victim, too, without any real basis. The contrived angst that grips Jill (Felicity Jones), Finkel’s wife, in the midst of his work on Longo’s case—including a ludicrous jail visit to confront Longo—is the final flailing attempt to cover Finkel with a patina of persecution. True Story feels like anything but, a pedestrian procedural grasping for a good yarn. The film closes with Finkel at a book reading—that was his destination all along.